1 of 3 Heat grill to medium-high. In a small bowl, combine lemon peel, garlic, coriander, 1/2 tsp of the salt, the cumin, black pepper and cayenne. Rub half onto both sides of chicken. 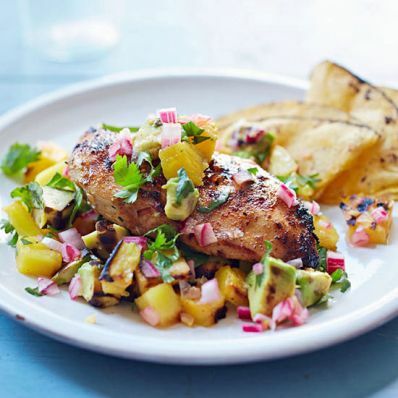 Whisk lemon juice and olive oil into remaining rub and brush onto pineapple and avocados. Grill pineapple for 12 minutes, turning twice so all sides are nicely marked. Meanwhile, grill avocado halves, cut side down, for 3 minutes, until nicely marked. Transfer pineapple and avocado to a cutting board. 2 of 3 Grill chicken for 10 to 12 minutes, turning once. Meanwhile, dice pineapple and avocado and gently mix together with red onion, cilantro and remaining 1/4 tsp salt. 3 of 3 Divide pineapple salsa among 5 plates. Top with a chicken breast half and serve with 2 tortillas per plate. 1 of 1 Always choose firm-ripe avocados for grilling: Gently press near the stem end with your thumb; there should be some give, without being too soft. Look for skin that is dark green, almost black. If not yet ripe enough, store on the counter in a paper bag for 24 hours and test again.